Persia Bottoms Up | Alley Cats Standard Figurines | One Price Low Flat Shipping! 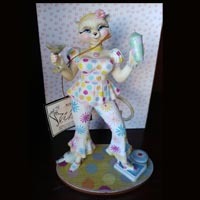 From the Alley Cats Retired Collection by Margaret Le Van, Persia Bottoms Up. Made of hand-paintd resin. Measures 7.5" tall. Manufactured by Artisan Flair, Inc. This fun Persia figurine is dressed in retro styled evening party attire. Her white slacks are bell bottoms and are adorned with different colored starbursts. Her top features polka dots of the same colors which match polka dots painted on the base. She is holding a martini glass in one hand and the shaker in the other. The detail to this figurine is rare Alley Cat is amazing. Brand new in box. Great Gift, Great Margaret Le Van Collectible!